"Sustainable development" quickly became the universal goal for environmentalists in the 1990s, motivated by the 1988 Brundtland Report and the 1992 Earth Summit in Rio. When the time came to bring theory into reality, sustainable development revealed far more complexity than first anticipated. To attain sustainable development in the full sense of the phrase"meeting present needs without compromising the resources needed for future societies"environmental and social concerns would need a constant presence in all major economic decisions. 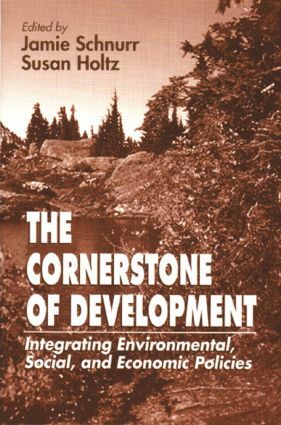 The Cornerstone of Development: Balancing Environmental, Social, and Economic Imperatives profiles many of the first attempts to implement sustainable development initiatives worldwide. The model: Canada's experience with "multistakeholder" decision-making. Under the guidance of Canada's National Task Force on Environment and Economy, nationwide and provincial round tables brought government officials together with corporate officers to formulate sustainable development guidelines. Authorized by the Canadian government to serve as an "Agenda 21 organization," the International Development Research Centre (IDRC) subsequently researched the feasibility of adapting the multistakeholder approach to the needs and practices of developing countries. The results are in these pages: valuable case histories from Africa, Latin America, Asia and Canada, each recounting the risks and benefits from integrating environmental, social and economic policies. When IDRC members were asked for ways to address environmental sustainability, they had few examples to follow"and little evidence that such endeavors could be fulfilled. The research and problem-solving efforts they produced are now collected here, for the guidance of other environment/development balance programs worldwide. Integrated Research and Policies in East Asia"P.S. Intal, Jr.